We have found all the web sources below useful but cannot vouch for their complete accuracy. If you can recommend any source not on our list, please email us with details (see Contact page). AMERICAN HOSTA SOCIETY The daddy of all hosta societies. A lot of the info is for members only but there’s still much for non-members. AHS HOSTA SHOW CLASSIFICATION LISTS FOR USE AT 2017 SHOWS If you want to know the mature leaf-size and registration date of a hosta than this is the place to come. AHS MINIATURE-LEAVED REGISTERED CULTIVARS AND SPECIES. This is the ‘Official’ list of miniature hostas. Also includes a separate list of unregistered cultivars (keep scrolling). As our Website points out elsewhere, AHS designated minis include some narrow leaved hostas up to 30cm (12”) in height. BRITISH HOSTA AND HEMEROCALLIS SOCIETY The British equivalent to the American Hosta Society. Well worth joining. Lots of useful information for non-members. HOSTA SOCIETY UK 640+ members. ‘For lovers & growers of Hostas in the UK to post pictures, ask questions & all things Hosta’. INTERNATIONAL MINI HOSTA GROWERS. 300+ members. Shares photos and experiences of mini hosta growers the world over. THE HOSTA HELPER US based but one of the most helpful and comprehensive sites we know. Begun by Don Rawson (see Hosta Lists below. HOSTA LIBRARY Perhaps the most comprehensive list of registered hostas there is. Multiple photos and in most cases a ‘My Hosta Database’ entry giving some registration details and comments. HOSTA LISTS: 100 INDIVIDUAL LISTS BASED UPON VARIOUS CHARACTERISTICS Don Rawson’s ‘Hosta Lists’ can keep you amused for hours. Besides providing 100 lists of hostas by facts and characteristics it also includes 67 lists of hostas for ‘Theme’ Gardens. So if you want to start collecting hostas with nautical names, names from the world of entertainment, space exploration or food, then this is the place to come. HOSTA REGISTRY (AMERICAN HOSTA SOCIETY) Provides the original registration details for all registered hostas. MYHOSTAS ‘The site for hostaholics’. 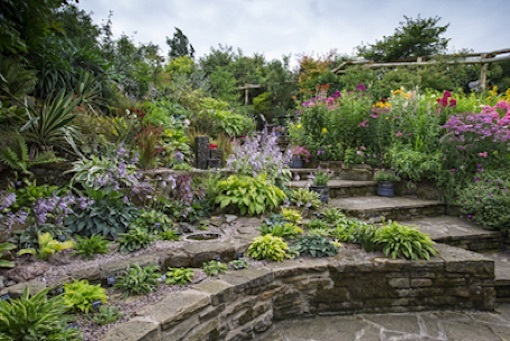 Some really useful sections including a list of hostas and their sports. Enough links to keep you attached to your PC or tablet for most of the year! ROOKIE’S GUIDE TO HOSTAS HOSTAS HOSTAS An e-book produced by PlantsGalore.com. Kindle edition available from Amazon. ROYAL HORTICULTURAL SOCIETY. PLANT FINDER Lists 2,600 hosta varieties and their suppliers in the UK. Just a caveat – not all specialist retailers submit their entries to the Plant Finder. Sometimes frustrating because entries must be in before some Nurseries have ordered their stock for the current year, so not always up to date.